This moment changed me profoundly. For years I had tried to be a good doctor and practice good medicine. 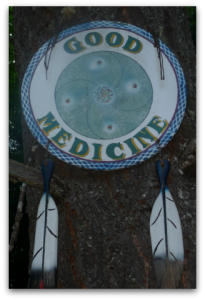 I had taught many others to practice good medicine, first pediatrics and then mind/body medicine. But the bishop’s words pointed to something more, and in the depths of my being I recognized what this was. Perhaps what is needed is not only to learn good medicine but to become good medicine. As a parent. As a friend or doctor. Sometimes just being in someone’s presence is strong medicine. – From “My Grandfather’s Blessings: Stories of Strength, Refuge, and Belonging” by Rachel Naomi Remen, M.D.